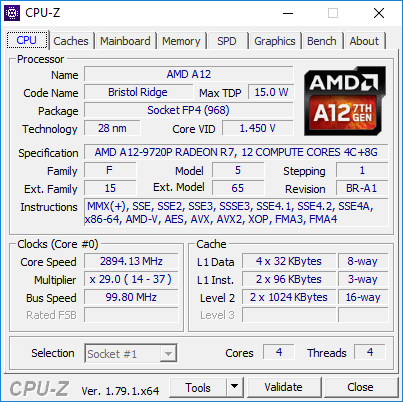 The AMD A12-9720P is a mainstream SoC from the Bristol-Ridge APU series for notebooks (7th APU generation), which was introduced in 2017. The ULV chip with a TDP of 15 Watts (can be configured to 12 Watts, not verified) has four CPU cores (two Excavator modules) clocked at 2.7 - 3.6 GHz (short time 4.05 for single core in our test sample), a Radeon R7 GPU as well as a dual-channel DDR4-1866 memory controller. Carrizo is a full-fledged SoC and is also equipped with an integrated chipset, which provides all I/0 ports. The performance of the A12-9720P should be slightly faster than the A12-9700P (slower clocks). Compared to Intel CPUs, the CPU is most comparable to Skylake Core i3 CPUs. Our first test sample however performt a bit worse than an average A12-9700P and on par with a i3-5010U (multi-core) and i3-4010U (single-core). Due to the TDP limitation, the performance of the A12-9720P will drop significantly under sustained workloads. AMD specifies the TDP of the A12-9720P with 15 Watts (not verified), which is comparable to Intel's ULV models. This means the CPU is a good choice for thin notebooks starting with a 12-inch screen.